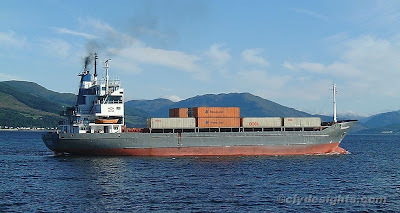 Employed on a service to Southampton during the summer of 2003, the containership MARIANNE was seen as she arrived on the Clyde early one day in July that year. She had been built in 1974 by the German Sietas shipyard as FRANCOP, and was mainly used on short-term charter work, much as similar vessels are today. The 93.2 metre long vessel, of 3,317 tonnes deadweight, spent two spells on charter to Manchester Liners, and carried the names MANCHESTER FAITH in 1976-77 and again in 1978-83. Since then she has carried a variety of names, including MARIANNE between 19998 and 2003. She is still trading as ARROW S under the Togo flag, managed by a company based in the Lebanon.